I don’t share what concoction I take each morning and night because whilst it’s right for me, it certainly won’t be right for you. I recommend testing to understand what you are deficient in and then selecting your supplementation accordingly. It’s not a quick fix in many cases. 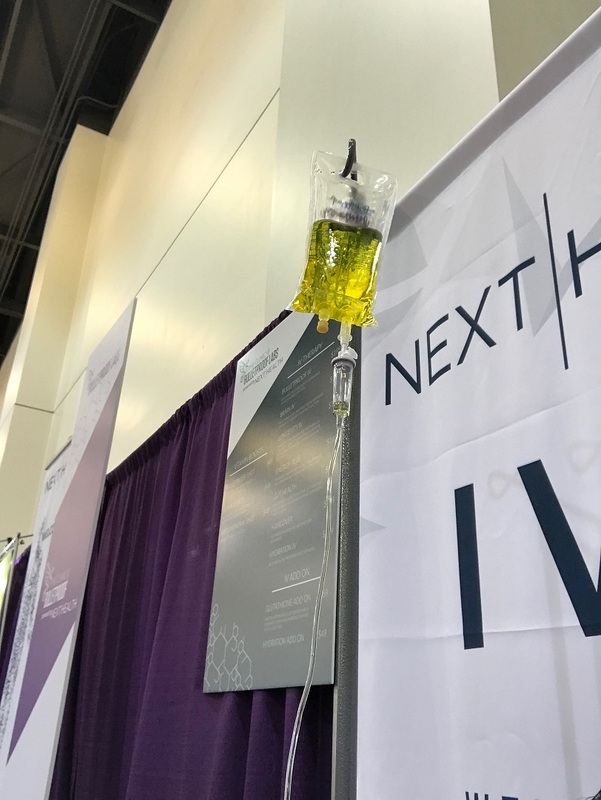 There is something that I do want to share with you and that’s my experience of intravenous vitamins, which I’ve now experienced at the Bulletproof Conference in California and also in London. For the past 2 years, I haven’t suffered with any colds or flu, despite having a snotty 8-year-old boy at home and I’ve put this down to my diet, supplementation and mega-dosing on vitamin C each time I get any sniffles. However, whilst on the plane flying to California, I must have sneezed 50-60 times and my nose started to stream. When I woke up on the Friday morning, my sinuses were blocked and I could feel pressure all across my face. I couldn’t believe my bad luck; here I was at a biohacking conference, full of cold. I’d registered at the conference on the Thursday evening, so I was up bright and early and at the conference hall at 7am for when the tech hall opened. As I wandered around I came across a stand run by Natural Health ?check? and they were selling intravenous vitamins. I couldn’t resist the Bulletproof I/V with a shot of glutathione. It transpires that this is part of the new Bulletproof Labs in Santa Monica. Putting in the needle was a painless process and I was surprised at how quickly the bag emptied into my arm – the sensation was strange at first and I had a slight metallic taste in my mouth. Almost instantly, I felt much more like myself; my energy levels picked up and within 45 minutes I felt back to 100% - I was gobsmacked at the impact this had. I felt great all day and for the remainder of the conference. For me, it was money well spent. I returned home raving about I/V but sceptical that it could have had such an impact so quickly. I wondered if it could have been a placebo? Oh well, who cares, I thought. I felt better and it saved me from having a grotty weekend. A couple of months later, I spoke with a couple of my Clients who were suffering with a heavy cold and the start of man-flu. I recommended to them to try I/V based on my experience in California, so they both went off to London for a Myers Cocktail with glutathione. Both reported back that they either felt 100% better straight after the I/V or when they woke up the next day. How amazing! Clearly, it’s unlikely to be a placebo. Just before Christmas, I was feeling pretty flat and one Thursday evening I felt exhausted. It had been a pretty full on few months and the run up to Christmas involved a lot of late and boozy nights. I booked in for an I/V in Shoreditch (Get a Drip) for their Full Works, which includes intravenous paracetamol, Myers Cocktail, glutathione, L’Carnine and a shot of B12. I felt much better straight after the I/V – the service and price point at Get a Drip was amazing and I’d highly recommend it. As I write this article, I’ve since referred a further 10 Clients and friends to Get a Drip and everybody has been very pleased with their service and how they’ve felt afterwards. So next time you are feeling run down, hungover, under the weather or suffering with manbola, consider having an I/V because whilst it’s not conventional, it definitely works.